Instilling future educators with the love of teaching and learning. Welcome to Husson University's School of Education webpages. For information beyond what you will find in these pages, please contact us. The mission of the School of Education is to prepare and graduate highly proficient and dedicated professionals in counseling, human relations, and education, who are committed to evidence-based principles and practices. 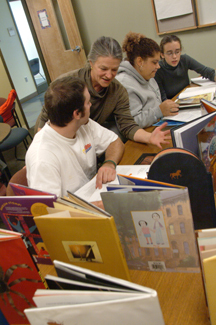 The School of Education is comprised of two distinct programs - the Undergraduate Teacher Education Program and the Graduate Counseling Program. We share our mission and our objective to provide superior preparation for the professions of teaching, counseling, and human relations. The Husson School of Education programs are built on a strong theoretical framework which models highly effective instructional strategies, current technologies, and research-based best practices. The rigorous coursework and rich experiences provided to students have been designed to prepare scholars for the demands of today's classrooms in a variety of educational settings.